Like most pretty serious cooks, I have a pretty serious spice collection. I’ve been a fan of buying my spices in bulk at my local Yuppie-Hippie Co-op for years now. I have tried many methods of storing my bulk spice purchases. 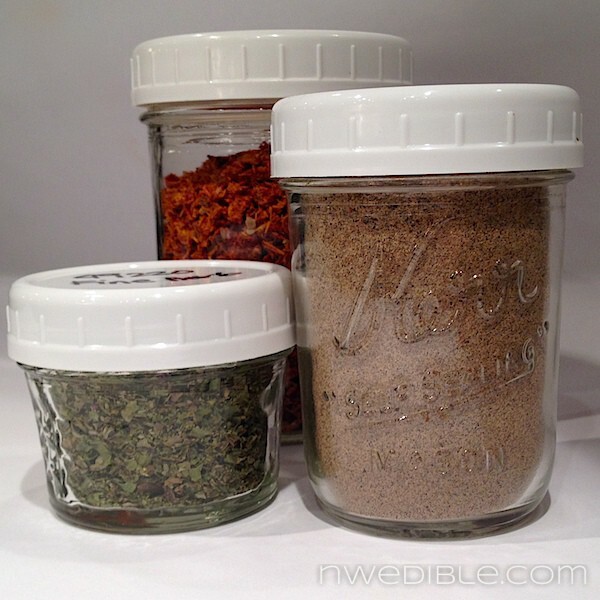 Fancy stainless magnetic jar things that looked oh-so-Martha when new proved disappointing as they aged: the magnets fell off and the plastic “window lids” were always falling though into the spices, causing clouds of cayenne to aerosolize all over my kitchen. DIY pepper spray anybody? My frugal Freecycle score of a case of clean baby food jars influenced my next attempt at organized spices. Oh, how cute this project looked on Pinterest and crafty websites like this. The chalkboard paint! The squat little jars! Adorable! The problem was, I hated the non-functionality of the jars. Those baby food jar lids are impossible to cleanly get on and off. They are really not designed for frequent opening and closing. It’s more a one shot deal, as becomes apparent after you try to relid your chili powder for five frustrating minutes. And then it hit me. Mason jars. Relatively cheap, super easy to clean, interchangeable (after washing) and big enough to hold a lot of spices. Topped with an inexpensive plastic mason jar cap, a half-pint jar became an ideal large spice jar. In what I can only describe as a kitchen miracle, 36 of this size jar plus plastic lid fits perfectly in my kitchen spice drawer. Hey, sometimes it’s better to be lucky than right, what can I say? Because I am not nearly as crafty or adorable as the people who come up with things like chalkboard-paint-covered-baby-food-jar-lids, and because my goal was to make this as streamlined an organization project as possible, I just wrote the name of the spice on the plastic lid with Sharpie. Because I use these lids all the time, I know that I can wipe Sharpie right off them with a little vodka or rubbing alcohol. I had been putting off restocking spices for quite while (because I hated my spice storage solution) but once my mason jars and plastic lids were in place I rushed right out to the Co-Op to stock up. And here’s where this storage solution really shines. You can take the clean jars in to fill directly from the bulk spices. You don’t have to put the spices in the little plastic drug baggie they give you, and spill a bunch, and mess around with those twist tie things and then try to find a pen to write on the twist tie and then get home and open up the bag and pour the spices into your container and spill more…. Nope. 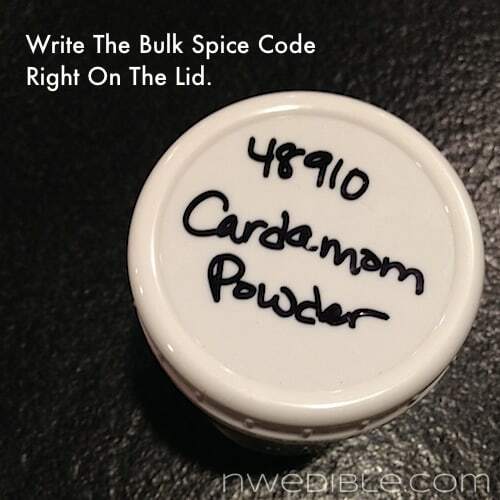 You just bring your Sharpie and write the bulk code right on the lid. No problem. Any decent grocery should be able to take the tare weight of any (clean!) container you bring in to use at the bulk foods section. Tare weight is the weight, usually of an empty container, that you don’t measure when weighing the contents of something. Tare rhymes with hair or bear, just FYI. So on your way in, stop by a checkout counter or customer service area and just ask the checker to please note the tare weight of your jars so that you can use them in the bulk foods section. If your checker looks at you like you are nuts, congratulations! You are probably a barnstormin’ frontline trooper of waste reduction in your community and you are to be commended for helping to tear down the barricade of habitual wastefulness. Alternatively, if you live in some greenie-green place like San Francisco or Seattle or Portland or Boulder and your checker looks at you like you are nuts, that’s just a sign you should find a better market. The best part about buying spices this way is bringing them home….done. There’s nothing to do except to put the spice jar back in the drawer or in the cupboard where you store your spices. 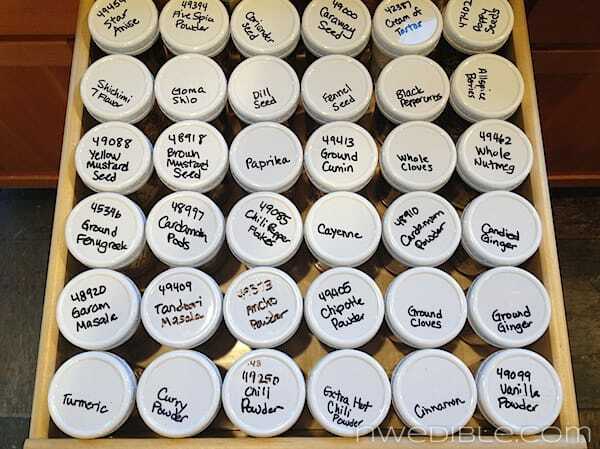 You’ve organized your spices, eliminated that irritating transfer step, and saved a lot of plastic baggies from use. I keep most of my spices in the half-pint glass regular mouth mason jars, but some bulky stuff (like my dried tomato peel) gets a big wide-mouth pint, and some stuff that I only need a little bit of gets a small 4-oz jar. Mason Jars – In the extremely unlikely event one of my readers doesn’t already have some mason jars kicking around, just make sure you check your cabinet or drawer for size before you buy a bunch of jars. You just want to make sure one of the standard sizes of mason jar will work for your storage needs and space. I used mostly half-pint, regular mouth non-quilted mason jars like the ones below but many people may find the 4 oz. jars to be a better size for the amount of spices they buy. Lids – you can use the two-piece lids that come with mason jars (this is a great project for reusing old flats, actually). You can even get crafty and paint the two piece lid with chalkboard paint and/or glue the flat to the ring to make it easier to open and close. I went for the less cute but more functional and (I think) easier to use option of plastic lids. I use this kind (like the ones below) and they are great. I have a ton of these lids and love them for things in jars, like jam after the jar’s been opened and is in the fridge. I used regular mouth, but you should select whatever lids match your jars. Amazon is selling these lids for about $6 for a box of 8, but I usually stock up when I find them at the local hardware store for about $4 for a box of 8, so keep your eyes peeled if you think these lids would be useful for you. And, um, it should go without saying, but just in case: these plastic lids are not ever, in any way, to be used for water bath or pressure canning type food preservation. Do you buy bulk spices? How do you keep your spices organized and in good shape? This is superb! Love it! I currently have my bulk buy spices in little plastic condiment containers in my lazy susan cabinet. I always spill them, they are stacked on each other so I can’t find anything, they get stuck behind the lazy susan, and then I can’t turn the thing. And I scream in frustration. My weekend project will be moving my spices to ball jars/ plastic lids and moving them to a drawer. Thank you for saving my sanity!! Awesome idea! And, please tell me… what is vanilla powder and what are you using it in? I’ve never heard of it, but I want some now! Yeah it’s basically a super fine vanilla sugar – excellent in coffee or for baking. I buy bulk spices mostly and every time I go I think what a waste the little baggies are (not to mention a pain to fill as you mention). I like this idea, though I think I’m more in the 4 oz camp for most things. Right now I have a bunch of glass spice jars somebody gave me, that are fine except some of my measuring spoons don’t fit in them. Contemplating turning a junk drawer (we shouldn’t have two anyway) into a spice drawer, which would open up a shelf in the pantry . . . oh the possibilities. What is the inside dimension of your drawer? I love that you had to add the “this should be common sense, but in case it ain’t” line at the end…. priceless! great post BTW! I don’t have a bulk spice section within probably 4 hours of me, so last year I organized a spice order among the locals from a bulk spice company in San Fransisco. I eventually had 12 people order spices. The company had price breaks at a quantity of 5 and 25. I charged everyone who ordered the amount for 1, and if we got over 5, I kept the difference. I also figured up their order on the company website to get their portion of the shipping as if they had ordered individually, and then when we put the bulk order in, I kept the difference in the shipping too. (I explained to everyone what I was doing, and they were all ok with it because I was doing all the work.) The difference of those two things covered my entire order of over $160 worth of spices. BTW, if you are out in the boonies like I am, this would be a great fundraiser for your schools. The prices are cheaper than the grocery store even with shipping (definitely per ounce, and even sometimes, it was cheaper to buy the pound of spice this way than the little 4 oz bottle at the grocery store), and even if you charged another 10% on top of that for an extra fundraising kick, it is STILL cheaper. Charge a flat fee for the shipping (per pound) so you don’t have to go through the pain I did of entering each order individually and then clearing it out, and you would have a great fundraiser. All that to say, when the spices came in, I had a bit of crisis on my hands because Where to put them? I used pint mason jars too, and printed out their names with a little Brother label printer. I had dreams of using super duper magnets and sticking them up under the cabinets, but I think I’ll just wrap the jars with picture hanging wire, screw in some hooks, and hang them under my cabinets. What was the name of the company? If you remember, I know this is an old post. That is an awesome idea! I just wish I had the kitchen space to do it! We also use mason jars or our spices! I am not as crafty as I’d like to be but we do have a cute little wooden angled shelf on the wall that they sit in (re-purposed accidental success). We’ve been using metal lids though, and I am finding that they are rusting a little so perhaps the plastic lids are a good idea. I love that you bring the mason jars to the store! And with the coded on them! Genius. Why on earth am I still fiddling around with bags & twist ties!?! We are very fortunate that our local co-op has an awesome selection of bulk herbs. I don’t like those Ball plastic caps because they are not remotely airtight. The ReCap lids are, but they are crazy expensive. I wish there were plain mason jar lids that had a gasket to form a nice airtight seal. Without the spout like on the recap, these shouldn’t be terribly expensive to produce or sell. Me, I just leave them in their original bags from Penzey’s until they go into the old spice jar after it’s been washed and dried. For larger spices and those I need more, I have an assortment of bottles picked up through the years. Alas, I don’t have a fancy spice drawer, so there’s no need for things to look pretty and exact! Available in regular or wide mouth! Thank you SO much for this idea. I was liking my Ikea spice jars except they are not big enough for the home grown and dried herbs, like Basil, and not so handy to label. I don’t have a store near me with bulk bins, but I buy some spices and herbs in the Mexican grocery aisle at my local rural supermarket. You can find Basil, whole cloves, whole peppercorns, ground hot chilies etc. on the rack for a fraction of the cost and usually twice the amount of the standard spice brands. At usually 1.75 for a 2-3 oz cellophane bag, you can experiment. There is a place below pikes place market in Seattle called spice world they have the most amazing spice and loose tea selection from all over the world. They do mail order although I dont know what their shipping costs are but as light as spices are i cant immagine its to much. And they have things like dried persian limes and tons of inhouse spice blends. Our local kitchen shop stocks some 6 cm. square by 4 cm. deep stackable clear-lid watchmakers containers that do the same duty. They are stacked 5-high in a cupboard over one of the kitchen counters, and I fill them from my bulk stash, squirreled away in my office. The labels are clearly visible from the cabinet door, they take up a minimum of space. I used to buy a lot of stuff from Penzey’s because I like the quality (where I don’t have access to fresh stuff out of the yard), but their shipping rates have become stupid, so I’ve found other sources, though a lot of the local bulk stuff is pretty dull. This system seems to have stuck, after many others that forced shuffling of jars and sifting through bags. Thank you very much for the post, as well as a host of previous material. I don’t have enough drawer space for a spice drawer (although I do have a tea drawer, so…). But, our home was built in 1936. It came with a built-in ironing board in the kitchen, still all original. I don’t iron if I can help it, but the cabinet is lined with metal. So we took out the ironing board, I found standard size one-piece mason jar lids and my husband glued super wazoo magnets to them. They top 4-oz jars (and a few 8-0z for some spice mixes). I buy my spices in bulk mostly from MRH and restock jars as needed. (I buy mostly whole spices so the shelf-life is quite long if stored appropriately.) It has been the best spice storage solution I’ve used thus far. Especially good because the cabinet is in an interior wall of the house, so it stays cool even in summer, and the door means they are protected from light. Plus it’s pretty. Sometimes I just open the door to look at them. I just reuse the various sized spice jars I already have on hand and put them on a double decker lazy susan in the cupboard. Yes, some have the tare weight written right on them for when I take them to the store. This system seems to take up the least space that way. Oh, and at least for me, another necessity is to have the containers in alphabetical order! Me too! 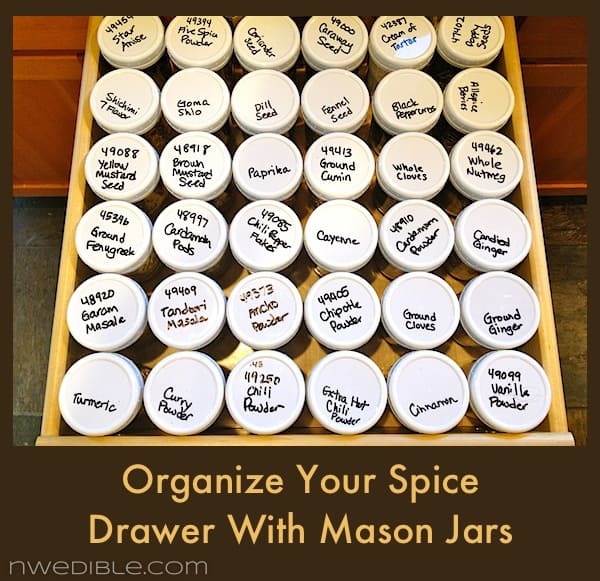 Alphabetically arranged, clearly labeled spice jars (mostly around the same size) aligned on a large, wood, countertop lazy susan are so pretty and so accessible and so… homey! I love to cook with various herbs and spices, and they chime right in with, “Pick me! No, pick ME!” Their covers eventually get bits of spice dust on them, so even between meals, my kitchen smells great. Another reason this is brilliant is the width of the jar opening. Most of my spices are in the regular spice jars and the openings are so small I can’t get a tablespoon measure into them. I have to pour the spice on the spoon and spill some. The wider mouth of these jars let me dip and not spill! I’m already using some mason jars for this and will slowly transfer everything over. Love reading your blog. I can appreciate an organized kitchen and pantry! I collect jars for my spices, old jam jars, canning jars, colored glass pill jars, they all look different, so I can spot them easily on the open spice shelf, which is very close to the stove 🙂 Pasta and tomato sauce ‘s like “classico” use solid lids that fit standard sizes mason jars. I raid my Mom’s recycling for them and use them whenever I can in place of the separating canning lids. Thanks for Blogging! This is awesome! I had no idea I could bring my jars into the store. 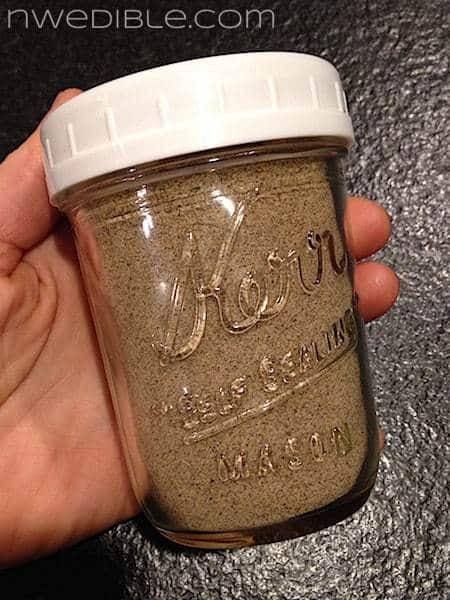 By the way, if you like shaker-type lids on some of your spices, the shaker lid from dry parmesan cheese container fits the half-pint mason jars. Brilliant! The bring-your-own-jar thing won’t work here, but I love the idea. However, I have jars that are are low enough to fit into a drawer and may just try that. Hey Erica where do you buy your bulk spices from? PCC near you or someplace else? Thanks. I’ve been thinking about doing exactly this for about 6 months and your article has pushed me over the edge and I think I’ll actually do it today. You’re brilliant again. Erica…you are brilliant. This is such a great idea. Also love that you threw in that you can wash the sharpie off the lids and how. Thank you. I love your blog. As an avid gardener, aspiring cook, and mother to a 22 month old boy, I can really relate. I love hearing your voice in your writing. I found it just a week or so ago when I was trying to figure out what to do with all my tomato skins from canning. Now I have extra jars of sauce and I dried the skins as well. My husband just built me a spice cabinet that I love using mason jars. I took pictures to show you but I don’t know who to send them to you. I used the jam jars with labels, in 2 sizes- they seem to work pretty well. I love fresh spices! I’m lucky enough to live in Chicago, which has at least 3 of the best spice shops in the country; The Spice House, Penzey’s, and Savory Spice. I know The Spice House, my personal favorite, grinds spices in store fresh every day and it’s still so much cheaper than the sawdust in the jars at the grocery store. I swear I’m not affiliated, I just love them so much. A brilliant solution that falls within my craftiness skill level! I recently did this! I printed out labels for the lid and side, so I can store them in my cabinet or my spice drawer. I use the two piece lids. I bought some of the white plastic lids because I’d much prefer a one-piece lid, but they didn’t seem very airtight. I could smell the spices with the plastic lid on and I can’t with the two pieces. I’m slowly buying half-pint jars and using them to standardize my spice rack. I just stick with the standard two-piece lids. I like 4oz & 8oz jars for home grown herbs. Have vintage lids of metal ring+white glass lid+gasket that I use to keep air tight. Great reading thru your posts on a wintry day-thanks! Can you use the Ball lids on other brands of mason jars? I have Bernardin.